One of the largest underlying changes to Windows 8 is the long-overdue shift from BIOS to UEFI. Secure Boot is one of the new features introduced by UEFI and it has received by far the most attention, as it prevents Linux distributions from being installed on Windows 8 machines. 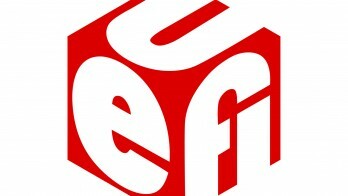 In this article we’re going to tell you a few methods to know if your computer supports UEFI. The simple way to tell if you have UEFI boot mode or not is to watch Windows starting up. If you see the Windows logo when it boots, you are in old fashioned BIOS boot mode. However if you see your manufacturer or custom BIOS logo remaining whilst Windows starts you are in UEFI mode! 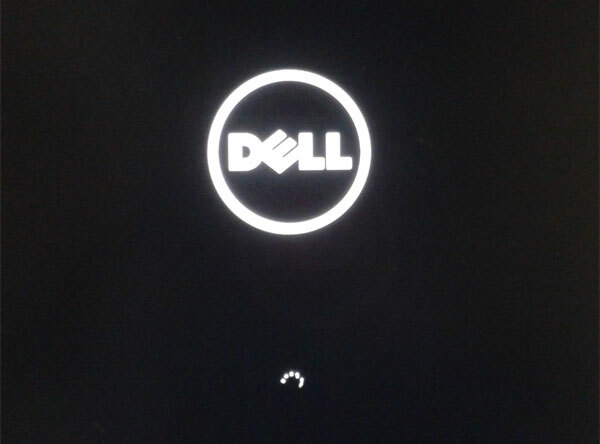 In my Windows 8 Dell computer which comes with UEFI BIOS, every time I turn on the machine, it will display a Dell logo with the looping circles at the bottom. Another method is to use the MSInfo command. Press Windows + R key combination to bring up the Run box in Windows 8. Type the “MSInfo” command and press Enter. It will display all your system information and hardware configuration in detail. From the System Information window, you’ll see BIOS Mode listed as UEFI if your computer supports UEFI. If you’re still uncertain if your computer comes with UEFI BIOS, you can check out the Secure Boot option by booting your computer into BIOS. Try to go through all your BIOS settings to look for an option such as “Secure Boot”, “Secure Boot Control”, “Attempt Secure Boot”, etc. If you can find that option, your computer is using the latest UEFI BIOS. How to Know If Your UEFI is 32-bit or 64-bit? If your UEFI computer comes with Windows 8 64-bit pre-installed, it uses 64-bit UEFI firmware. If your UEFI computer comes with Windows 8 32-bit pre-installed, it uses 32-bit UEFI firmware. While in UEFI mode, the Windows version must match the PC architecture. A 64-bit UEFI PC can only boot 64-bit versions of Windows. A 32-bit PC can only boot 32-bit versions of Windows. If you want to run a 32-bit Windows on a 64-bit UEFI PC, you need to change the boot mode from UEFI to Legacy/CSM and disable the Secure Boot option in BIOS. However, not all UEFI computers provide with the compatibility support module (CSM) that enables UEFI firmware to emulate a legacy BIOS. My grandfather just bought an ASUS notebook PC with Windows 8 and set a password for the administrator account. However, he is up in age and forgot his password soon (did not write it down). Now he is trying to log in but of course it’s locked. How to unlock or reset a forgotten Windows 8 password on an ASUS laptop? Forgot Windows 8 password and can’t log on your ASUS computer? How to unlock the administrator account without resetting your ASUS PC to factory settings? There are lots of bootable utilities which can help you reset Windows login password from a bootable CD, but most of them don’t support Windows 8 and they are also incompatible with UEFI BIOS. If you’ve bought an ASUS computer with Windows 8 pre-installed, you’ll find that you can’t get it to boot from a Live CD as usual. That is because most of Windows 8 PCs use a new UEFI BIOS rather than the traditional BIOS, and you need to enable the Legacy BIOS support in BIOS. 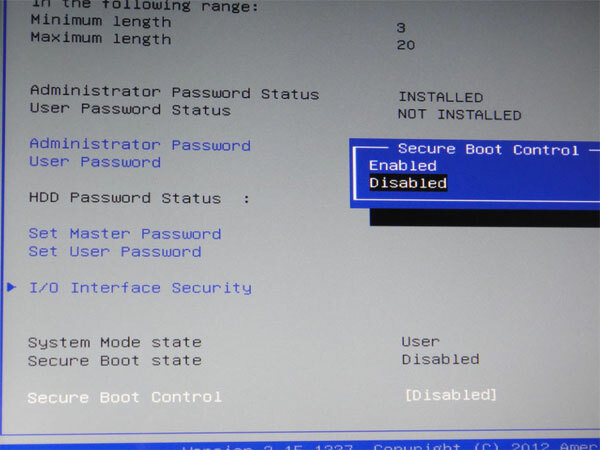 In this tutorial we’ll show you how to easily reset lost Windows 8 password for UEFI-based ASUS computer. How to Reset Lost Windows 8 Password for UEFI-based ASUS Computer? Place the Live CD into the CD drive of your locked Windows 8 ASUS computer. Now we need to make some changes with the computer in order to get it to boot from the Live CD. Power off the computer. As soon as the ASUS logo appears, immediately press F2 key to enter the BIOS. Use the arrow key to select Boot tab and enable the Launch CSM option and disable the Fast Boot option. Switch to the Security tab and disable the Secure Boot Control option. Save your changes and exit. Turn off your computer and power it on again. Quickly press ESC key to access the Boot Menu. This time the Live CD will show up in the Boot Menu. Choose your Live CD and press Enter. If you can’t bring up the Boot Menu, you can also press F2 key to enter into BIOS and set CD/DVD-ROM as the first boot option. After successfully booting from the Live CD, the computer will open up the Reset Windows Password program after a few minutes. The program automatically searches the Windows SAM registry hive for your Windows 8 installation, and then display all of local user accounts on your ASUS PC. Choose a user account and then click on “Reset Password” button. It will reset your forgotten Windows 8 password instantly. Restart the computer and take out the Live CD from the CD drive. Remember to reset your BIOS settings to their factory defaults, otherwise Windows 8 will fail to boot. When the ASUS computer boots into the Windows 8 login screen, you can then log in to your user account with a blank/empty password! Recently I got a UEFI-based Toshiba Satellite laptop which comes with Windows 8 pre-installed. But I have forgotten the administrator password and can’t log in. How can I recover or reset the password without re-installing the operating system? Forgot Windows 8 password on your Toshiba laptop? How to unlock a UEFI-based Toshiba computer if you lost the administrator password? UEFI is intended to replace the traditional BIOS and nearly all Toshiba computers that come with Windows 8 pre-installed are shipped with UEFI. The problem is that most password cracking boot CDs are not compatible with UFEI so it’s difficult to get them to reset/recover your forgotten password. Luckily, there is a quick fix for this compatibility issue. In this tutorial we’ll walk you through how to reset lost Windows 8 password for UEFI-base Toshiba computer. How to Reset Lost Windows 8 Password for UEFI-based Toshiba Computer? Once downloaded and installed, click on the “Windows Password” button to open the bootdisk creating window. 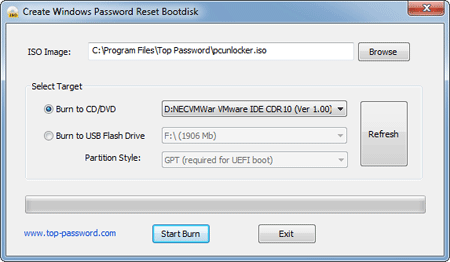 Choose your target device (CD/DVD or USB flash drive) and click on “Start Burn” button to start creating the Windows password reset bootdisk for you. Once done, click the OK button and unplug the USB device or remove the CD/DVD. Now insert the bootable CD/CD or USB drive into your locked Toshiba computer. Power on the system and while the TOSHIBA logo appears, press F2 key to enter the BIOS Setup Menu. 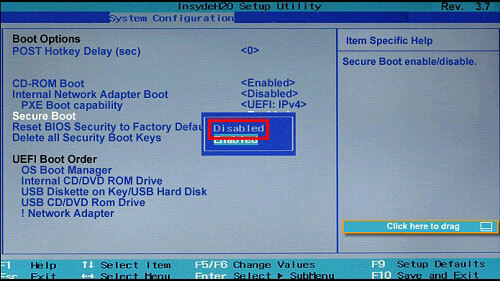 Select Security tab and set the Secure Boot to Disabled. Select Advanced tab and go to System Configuration. Change the Boot Mode option from UEFI Boot to CSM Boot. Press F10 key to save and exit. 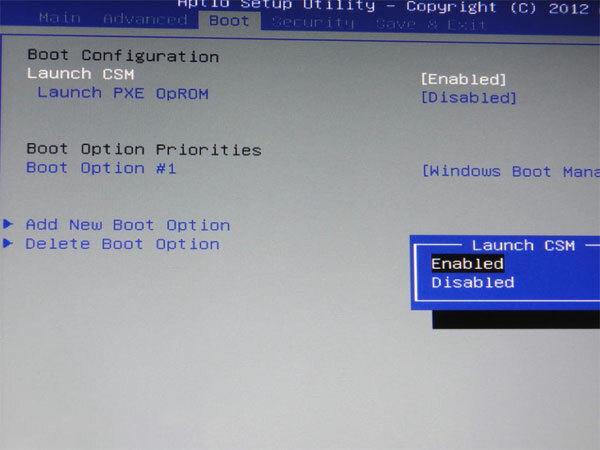 Note: On some Toshiba computer, you may need to choose the Boot tab, then enable the Launch CSM option and disable the Fast Boot option, or disable the UEFI Boot option. Then switch to the Security tab, set Secure Boot Control to Disabled. When the computer restarts, quickly press ESC or F12 key repeatedly until you see the Boot Menu. Choose the CD or USB drive you’ve created from the Boot Menu. Sit back and let the system load some required files that are necessary to complete the password reset operation. 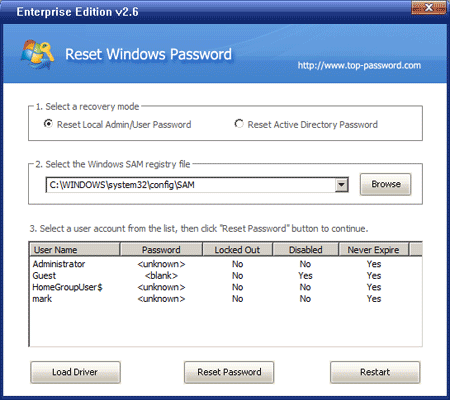 Once you are presented with the Reset Windows Password window, choose your Windows 8 SAM registry file from the drop-down menu. This comes useful in case you’re running a dual boot machine. Once selected, the program will display a list of user accounts for your Windows 8 installation. Choose the user account that needs a password rest, and click on “Reset Password” button. It will blank your Windows 8 password instantly. It’s simple as that! Now click Restart button to reboot your machine and remove the CD/USB drive. You can then log back into your Windows 8 Toshiba computer without a password! I have an Acer Aspire V5 laptop running Windows 8 with Phoenix BIOS running UEFI boot. I forgot the administrator password and now I am locked out. I’ve searched the web for how to reset Windows 8 password for computer which comes with UEFI BIOS, but there is no Live CD that supports UEFI-mode booting. So how do I reset my forgotten admin password? If you’ve purchased an Acer computer with Windows 8 pre-installed, you’ll find that you are unable to boot up your PC using the Live CDs that you have ever used. This is because almost all Windows 8 PCs are shipped with UEFI BIOS, which replaces the traditional PC BIOS. 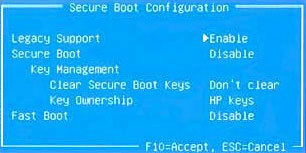 The Secure Boot feature included in UEFI will prevent you from running operating systems other than Windows 8. So what to do if you’ve forgotten the Windows 8 administrator password on your Acer computer? In this tutorial we’ll walk you through how to reset lost administrator password on an Acer computer which comes with Windows 8 pre-installed in UEFI boot mode. How to Reset Forgotten Windows 8 Administrator Password on Acer Computer with UEFI BIOS? To get started, you need to create a Live CD (or USB flash drive) on another PC that you can access. 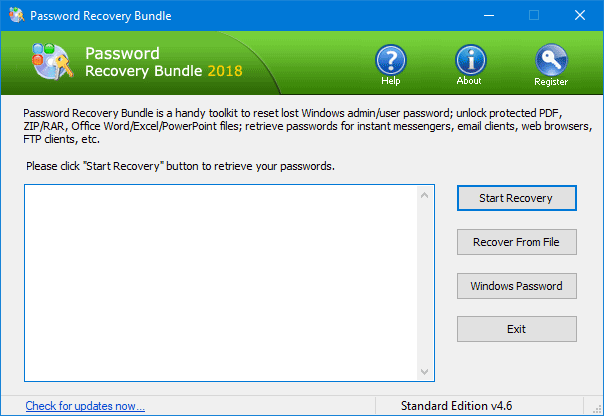 Download the Reset Windows Password utility and save it on your desktop. Unzip the download file and you’ll get a bootable ISO image. Burn it onto an empty CD using ISO2Disc, BurnCDCC or other ISO burning software. Place the Live CD into the CD drive of your locked Windows 8 Acer computer. Now we need to make some changes with the computer in order to get it to boot from the Live CD. Power off the computer. As soon as the Acer logo screen appears, immediately press F2 or Del key to enter the BIOS. Use the arrow key to select Boot tab. 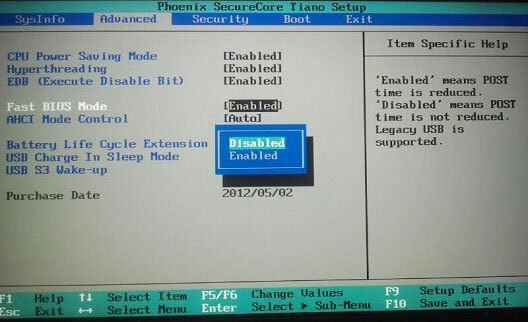 Choose the Boot Mode and press Enter to change the setting from UEFI to Legacy BIOS. Move to the Secure Boot option and disable it. Next change the boot order to CD/DVD-ROM and press F10 to save your changes. Note: If you can’t find the UEFI boot mode in BIOS, try to switch to the Boot Options tab. With Launch CSM highlighted, press Enter and use the down arrow to select Always. Then switch to the Authentication tab, choose the Secure Boot option and press Enter to select Disabled. 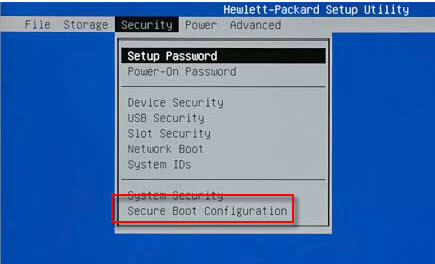 After successfully booting from the Live CD, the computer will open up the Reset Windows Password program after a few minutes. The program automatically searches the Windows SAM registry hive for your Windows 8 installation, and then display all of local user accounts on your Acer PC. Restart the computer and take out the Live CD from the CD drive. Remember to change your computer’s boot mode from Legacy BIOS back to UEFI, otherwise Windows 8 will fail to boot. When the Acer computer boots into the Windows 8 login screen, you can then log in to the administrator account with a blank/empty password. It’s that easy! I have a Sony Vaio laptop which comes with Windows 8 installed in UEFI mode. But I have forgotten the administrator password and can’t log in to the computer. Is there a way to override or reset the password without wiping the entire system? Have you tried to log into your Windows 8 administrator account on your Sony laptop and it keeps saying that the password you’ve entered is incorrect? Whether you forgot the password, or or know it but still can’t log in because your account is locked out or disabled, there is always a way to unlock your Sonly laptop. Since all computers that ship with Windows 8 use the UEFI replacement for the traditional BIOS, this will cause lots of bootable utilities to be unable to boot your Windows 8 computer. But there is also pretty easy fix. In this tutorial we’ll walk you through how to reset forgotten Windows 8 password on Sony laptop with UEFI BIOS. How to Reset Forgotten Windows 8 Password on Sony Laptop with UEFI BIOS? To get started, you need to create a Live CD (or USB flash drive) on another PC that you can log on as administrator account. Download the Reset Windows Password utility and save it on your desktop. Unzip the download file and you’ll get a bootable ISO image. Burn it onto an empty CD using ISO2Disc, BurnCDCC or other ISO burning software. Place the Live CD into the CD drive of your locked Windows 8 Sony laptop. Now we need to make some changes with the computer in order to get it to boot from the Live CD. 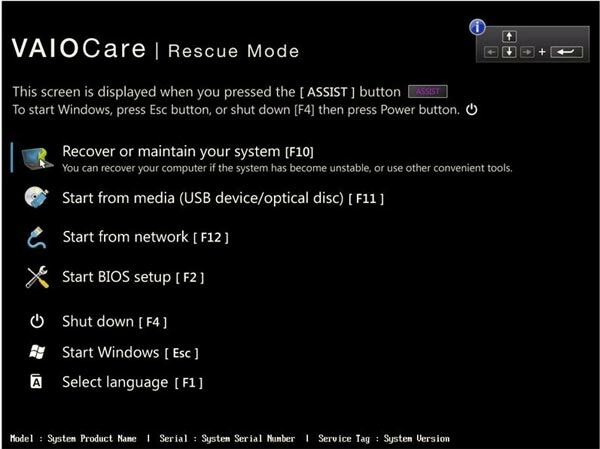 Power off the computer, press the Assist key to enter the VAOCare Rescue Mode Boot screen. 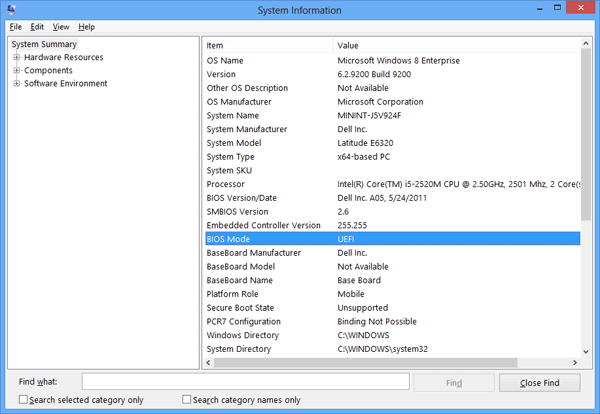 Select the Start BIOS setup [F2] option to proceed to the system BIOS. Once inside the BIOS Setup Utility, use the arrow keys to select the Boot tab. 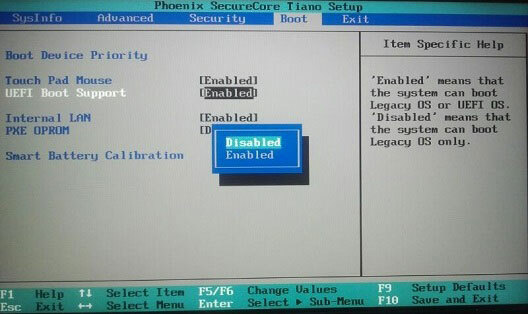 With the Boot Mode option selected, press Enter to change the setting from UEFI to Legacy. Next switch to the Security tab, disable the Secure Boot option, and save your changes. Turn off the computer again and press the Assist key to enter the VAOCare Rescue Mode Boot screen. Select the Start from media (USB device/optical disc) [F11] option to proceed. Now the computer starts to boot from the Live CD. After one or two minutes, the computer will open up the Reset Windows Password program. The program automatically searches the Windows SAM registry hive for your Windows 8 installation, and then display all of local user accounts on your PC. Choose a user account and then click on “Reset Password” button. It will unlock your account and blank/remove the forgotten Windows 8 password immediately, also enable the user account in case it was disabled. Restart your laptop and take out the Live CD from the CD drive. Remember to change your computer’s boot mode from Legacy back to UEFI. Then you can log back into your Windows 8 Sony laptop without being asked to enter a password. It’s that easy!